It's considered a partial hysterectomy when your Cervix is not removed, and a total hysterectomy when it is removed. Most times both the ovaries and fallopian tubes are untouched during this procedure, and the ovaries being left behind are the reason a woman doesn't immediately enter into menopause. The ovaries are responsible for the production of Estrogen the hormone that controls the reproductive cycle. When a woman's ovaries stop producing eggs and subsequently stop producing the hormones estrogen and progesterone, and woman experiences menopause. Menopause can also occur if the ovaries are damaged or removed. Under "normal" circumstances, menopause gradually happens between the ages of 45 and 55 and becomes apparent as a woman's menstrual cycle tapers off. This transition phase is called Perimenopause, which a woman who has had a hysterectomy isn't able to detect on her own. During this time women can experience a variety of symptoms ranging from mild to severe, and the only difference between a woman who has had a hysterectomy and one who hasn't is the tapering off of the menstrual cycle. So how does a woman who has had a hysterectomy know if she has entered into menopause? She must visit with her doctor who can do a blood test to determine her estrogen level which give the doctor a good indication if she has reached the menopause phase of life. 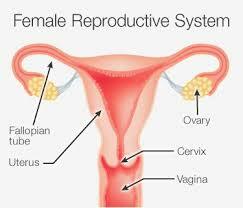 As you can see, the only difference in how a woman transitions into menopause after a hysterectomy, if she still has her ovaries, is the tapering off of the menstrual cycle for it is the amount of estrogen produced by the ovaries that has a significant impact on the woman's symptoms and health. What's the deal with Estrogen? There are a wide range of effects as a woman's estrogen levels lower, ranging from energy levels to cognitive issues. So women should be aware of what estrogen does and why it is necessary during every stage of their life. Estradiol - the most common type found in non-pregnant women of childbearing age, and its main function is assisting with the monthly egg release from the ovaries. Estrone - produced in the ovaries, as well as fat cells, is the form found upon post-menopause. Estriol - occurs in abundance at pregnancy and released by the placenta. Dry Itchy Skin - Estrogen stimulates the formation of skin-smoothing collagen and oils, and when these natural moisturizers diminish the result is dry itchy skin. There are a number of ways to combat this side effect including the amount of "smart fats" in your diet. Weight Gain - When estrogen is stored inside a cell, there is the less space for fat to reside. Also, the enzyme, hormone sensitive lipase (HSL), which regulates fat metabolism, is also spurred into action with the presence of estrogen. However, this takes place more often than not during exercise. I hope I've answered some of your questions about hysterectomies and menopause. You can learn more at the links below!